People often choose to separate exercise from family and social life and subsequently end up sacrificing one of the two most important aspects of their lives. What if you didn’t have to? Health and fitness is a fantastic and fun way to bring your whole family together and improve everyone’s wellbeing in one clean swoop. It’s never too early to get your young kids kicking-about and learning what it takes to live a healthy lifestyle. Health and wellness on its own probably won’t be enough to entice the younger generation to join you on your journey. We’ve all seen the disappointment in some children’s eyes when they look at the nutritious greens on their dinner plate, and the extreme lengths parents will go to hide them in their meals! Why not apply the same theory to physical activity? Get your household chores out of the way in half the time with a house clean up. Turn it into a family event and race to see who finishes their tasks first. That’s bound to get the heart pumping, and the muscles working as each parent and sibling compete against the clock to see who will come out victorious! Or get the gardening tools out of the shed and make it an outdoor occasion and experience the added benefit of some fresh air and vitamin D.
Work up an appetite or work off your dinner with a pre or post dinner walk with the whole family. However, don’t just wander aimlessly, pick a destination that will get everyone hyped up to power through to the finish. You could even bring the dog along. Exercise doesn’t always have to be centred around various adult activities. Channel your inner child and get your health fix by jumping into a game of their choice. It’s as simple as playing hide and seek in a large area, or with a shorter countdown to really turn the heat on your hiding abilities and calorie count. Once you open your mind the possibilities become endless, and the family will without a doubt be grateful for the wonders you’ve done to their health as well as your own. 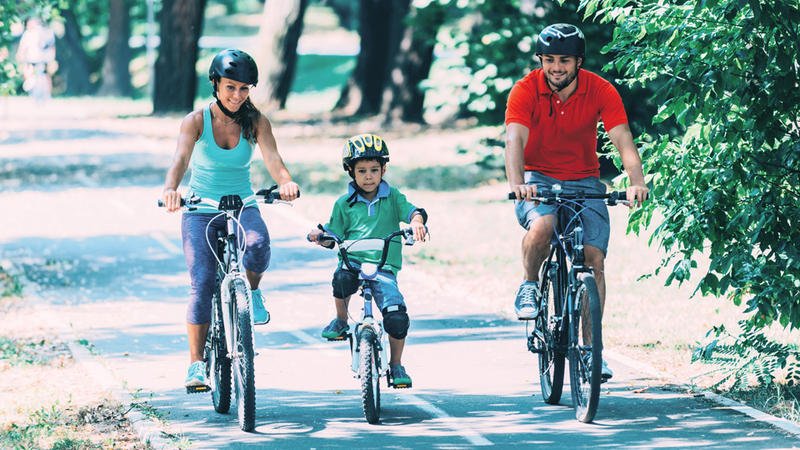 Next time you see the family parked in front of the TV for hours on end on a beautiful day, put your thinking hat on and find a way to get the family together for some fitness fun!